In this Japanese name, the family name is Tsuda. Tsuda Umeko (津田 梅子, born Tsuda Ume (津田 うめ); December 31, 1864 – August 16, 1929) was a Japanese educator, Christian, and pioneer in education for women in Meiji period Japan. Originally named Tsuda Ume, with mume or ume referring to the Japanese plum, she went by the name Ume Tsuda while studying in the United States before changing her name to Umeko in 1902. Tsuda Ume was born in the Ushigome neighborhood of Edo (present Minami, Shinjuku) as the second daughter of Tsuda Sen and his wife Hatsuko, a progressive agriculturist and strong proponent of the westernization and Christianization of Japan. In 1871, Tsuda Sen was involved in the Hokkaido colonization project under Kuroda Kiyotaka, and raised the topic of western education for women as well as for men. Under Kuroda’s sponsorship, Tsuda Ume was volunteered by her father as one of five women members of the Iwakura mission. At the age of six, she was also the youngest member of the expedition. She arrived in San Francisco in November 1871 and remained in the United States as a student until she was 18 years old. Tsuda lived in Washington, D.C. from December 1871 with Charles Lanman (the secretary of Japanese legation), and his wife Adeline. As they had no children, they welcomed her like their own child. Under the name of Ume Tsuda, she attended the middle-class Georgetown Collegiate School, where she learned English. After graduating, she entered the Archer Institute, which catered to the daughters of politicians and bureaucrats. She excelled in language, math, science, and music, especially the piano. In addition to English, she also studied Latin and French. About one year after arriving in the United States, Tsuda asked to be baptized as a Christian. Although the Lanmans were Episcopalians, they decided she should attend the nonsectarian Old Swedes Church. By the time Tsuda returned to Japan in 1882, she had almost forgotten Japanese, her native language, which caused temporary difficulties. She also experienced cultural problems adjusting to the inferior position of women in Japanese society. Even her father, Tsuda Sen, who was radically westernized in many ways, was still traditionally patriarchal and authoritarian with regards to women. Tsuda was hired by Itō Hirobumi to be a tutor for his children. 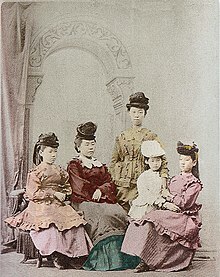 In 1885, she then began to work in a girls' school for the daughters of the kazoku peerage, known as Peeresses' School, but she was not satisfied by the restriction of educational opportunities to within the peerage and nobility, and she was not satisfied with the school policy that education was intended to polish girls as ladies and train them to be obedient wives and good mothers. She was assisted from 1888 by a friend from her days in America, Alice Bacon, from 1888. She decided to return to the United States. Tsuda Ume (1864–1929) at Bryn Mawr College graduation. Tsuda returned to the United States and attended Bryn Mawr College in Philadelphia from 1889 to 1892, where she majored in biology and education. She also studied at St Hilda's College, Oxford. During her second stay in the United States, Tsuda decided that other Japanese women should have the opportunity to study overseas as well. She made numerous public speeches about Japanese women's education and raised $8,000 in funds to establish a scholarship for Japanese women. After returning to Japan, Tsuda Ume once again taught at Peeresses' School, as well as at Tokyo Women's Normal School, her salary was 800 yen and her post was the highest available to women of her era. She published several dissertations and made speeches about improving the status of women. The 1899 Girl's Higher Education Law, required each prefecture to establish at least one public middle school for girls. However, these schools were not able to provide girls with the same quality of education as that of the boys' schools. In 1900, with the help of her friends Princess Ōyama Sutematsu and Alice Bacon, she founded the Joshi Eigaku Juku (女子英学塾, Women's Institute for English Studies) located in Kōjimachi, Tokyo to provide equal opportunity for a liberal arts education for all women regardless of parentage. She later changed her name to Tsuda Umeko in 1902. The school faced a chronic funding shortfall, and Tsuda spent much time fundraising in order to support the school. Due to her enthusiastic efforts, the school gained official recognition in 1903. In 1905, Tsuda became the first president of the Japanese branch of the Tokyo YWCA. Tsuda's busy life eventually undermined her health, and she suffered a stroke. In January 1919, she retired to her summer cottage in Kamakura, where she died after a long illness in 1929. Her grave is on the grounds of Tsuda College in Kodaira, Tokyo. The Joshi Eigaku Juku changed its name to Tsuda Eigaku Juku in 1933 and, after World War II, became Tsuda College. It remains one of the most prestigious women's institutes of higher education in Japan. Although Tsuda strongly desired social reform for women, she did not advocate a feminist social movement, and she opposed the women’s suffrage movement. Her activities were based on her philosophy that education should focus on developing individual intelligence and personality. Tsuda Umeko will be featured on new Japanese banknotes to be issued in 2024. ^ Nussbaum, Louis-Frédéric. (2005). "Tsuda Umeko" in Japan Encyclopedia, p. 998, p. 998, at Google Books.